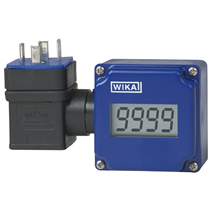 The model A-AI-1 and A-IAI-1 attachable indicators are the ideal solution for an on-site display with simultaneous signal transmission. Due to its open programmability and easy installation, even for transmitters already in service, the attachable indicator can be easily and quickly added without difficulty. An additional power supply is not necessary. The instrument is configured using three buttons which are located under the front cover. A logically-structured menu guides the operator through all the necessary programming steps using simple characters on the LCD panel. It is possible to set the indication range and both offset and slope adjustment. In addition, if required, a filter can be activated and set in various stages. The filter suppresses short spikes and thus enables the easy readability of the display. All programmed parameters are stored in an EEPROM and are preserved in the event of power outage. The A-IAI-1 attachable indicator has been developed specifically for use in hazardous areas. This attachable indicator can be combined with Ex transmitters and also with an Ex transmitter power supply or an Ex galvanic isolator and thus enabling its use in Zone 1 areas. The attachable indicator has its own integrated self-diagnostics, which continuously monitors that the key components of the device are working properly. The integrated self-diagnostics, as well as the reporting of an over-range or under-range condition, ensure high operational safety. With its robust and compact plastic case, the attachable indicator fulfills the ingress protection IP 65 and is thus exceptionally suitable for a wide range of industrial applications.